Farm Sanctuary's "What Did You Do" Campaign. Join My Team! Farm Sanctuary is leading the countdown with their "What Did You Do?" campaign. I'm proud to say I've joined "Team Gobble" and hope to help inspire you guys to join my team! Those who join me will be helping to support the inspiring work that Farm Sanctuary does, creating animal survivor stories worth sharing and talking about. If you love animals like me, click ahead to find out more. Must-See Bonus: cute animal pics ahead. (Those who donate can enter my team giveaway too!).. Animal lover? Me too. Team Gobble today. This is Shannon. Team leader material for sure.. Happy farm animals of all sorts make me very happy as well. Like these happy pigs at Farm Sanctuary. They almost make me want to dive in and take a mud bath. Almost. I don't often do animal-themed posts her on HHL, since this is a "vegan food blog." But when Farm Sanctuary asked me if I wanted to participate in their WDYD campaign this year, I was honored, excited and ready to share. Also on Team Gobble: Shannon Elizabeth, Mayim Bialik, Tony Kanal, Kevin Nealon and more. Check out these teams! Love..
Join My Team, via Team Gobble! or keep reading to learn more. I love the concept of this campaign. "What Did You Do?" Farm Sanctuary is asking the question: "What did you do when you learned about animal cruelty?" So years from now, when kids and teens ask us about these times, it will be an awesome feeling to be able to say you did something for the animals in 2013. 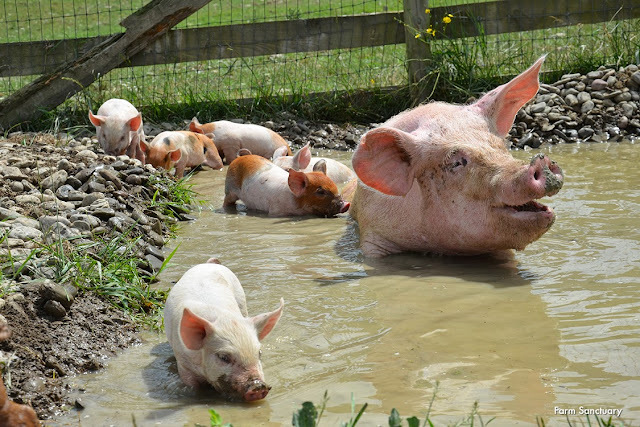 You were not part of the problem, but part of the solution that lead to a more compassionate world - where farm animals are more than just food. An evolved time when compassion and plant-based living reigns supreme. I can totally see that future and I hope you can too. Way Back When. I remember growing up in Santa Cruz California, being surrounded by ex-hippies and ECO-passionate people who were chugging wheatgrass, crunching on hemp granola, stocking up their kitchens with organic farmer's market produce, slicing cubes of tofu, riding their bikes to work (my high school science teacher rode 25 miles each day!) and wearing alternative material fashions long before it was "cool or trendy" to do so. Those early-adapter vegetarians and planet-friendly trailblazers mean so much more to me now as I look back. And I hope future generations will look back on ME and YOU and think the same thing. I want to be a cheerleader for animals, a trailblazer for veganism and plant-based living and removing the concept from people's minds that animals are food. And rather that animals are our friends. We share this planet with them. Peace should only seem natural between us. In 2013, I was sippin' a green smoothie, wearing faux leather shoes and cheering for "Team Gobble"
MY REQUEST: What if every HHL reader donated $10 today. That would be amazing! And YOU would be making a difference. If you can donate more, super. And if you cannot donate anything, fine too! JUST BY READING THIS IT SHOWS YOU ARE INTERESTED. And inspiring your own compassion today may lead you to donate or help in your own way in the future. And that is pretty awesome. Click the logo below to join TEAM GOBBLE - my page!.. 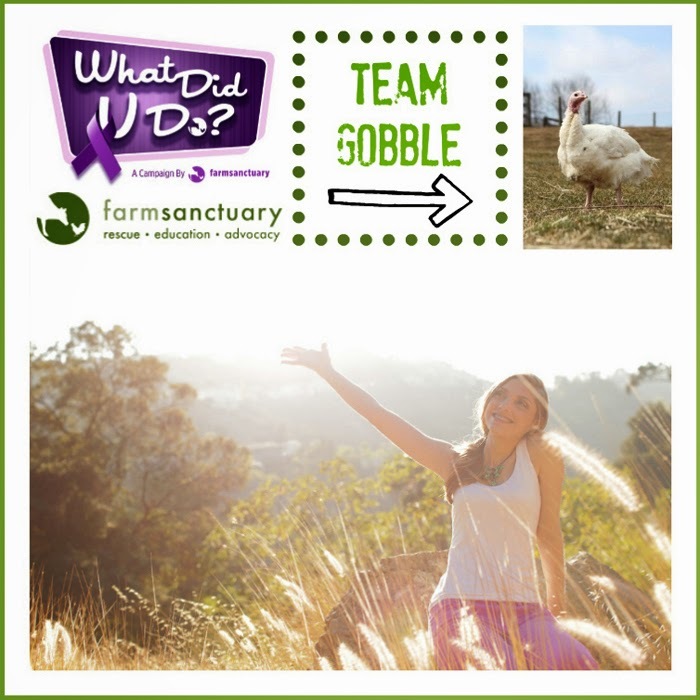 Team Gobble is getting the word out about helping turkeys like Daisy and Shannon that have had to, and continue to endure the cruelties they are put through in factory farms. FS's amazing "Animal Angel" donors have issued a challenge. If we can reach $25,000 they will double it! 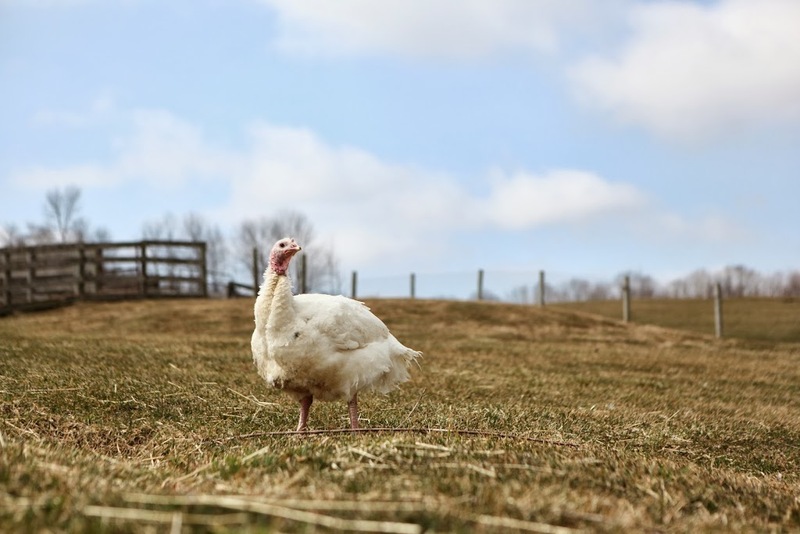 Daisy: A Fall from a Truck Bound for Slaughter Made for this Turkey’s Safe Future. Injured and overweight when rescuers found her, Daisy had most likely fallen off a truck bound for the slaughterhouse after enduring weeks of fattening in an industry warehouse. The tumble could easily have killed her. Similar transport accidents kill countless other farm animals, but instead it saved her life. Shannon: A Turkey’s Journey from Warehouse Confinement to Sun-drenched Pasture. Shannon was scared and exhausted when she arrived at Farm Sanctuary’s New York Shelter. And as soon as they saw her, caregivers knew from seeing her mutilated beak and toes that she had come from an industrial turkey farm. photo credits: All animal photo credits are to Farm Sanctuary.